Baldwin County’s newest judges in the 28th Judicial Circuit were recognized during an investiture ceremony at the Baldwin County Courthouse on July 10 in Bay Minette. Scott Taylor was sworn in as Circuit Court Judge, replacing retiring judge Robert Wilters, while J. Clark Stankoski was sworn in as District Court Judge. Newly appointed Baldwin County Circuit Court Judge Scott Taylor. A former District Court judge, Taylor was appointed by Gov. Robert Bentley to replace retiring judge Robert Wilters in June. On July 7 Bentley appointed Stankoski, of the Fairhope-based firm Stankoski LLP, to fill the district judge position vacated by Taylor. Taylor earned his Juris Doctorate from the Thomas Goode Jones School of Law and has practiced criminal, juvenile, domestic relations, real estate, tort law, adoption, municipal planning and zoning, contract law and more. Stankoski earned his Juris Doctorate from the Thomas Goode Jones School of Law. He is the City Attorney for the Town of Silverhill, served as Baldwin County Assistant District Attorney from 1998-2002 and worked in the Alabama Attorney General’s office from 1995-1997. Newly appointed Baldwin County District Judge Clark Stankoski, left, is congratulated by Judge J. Langford Floyd. 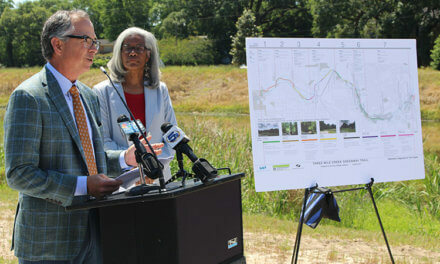 Stankoski cited his work as a contract attorney for the county as a significant influence on his life. He said Judge J. Langford Floyd, who is the Baldwin County Judicial Commission Chairman, approached him about 10 years ago asking if he’d be interested in contract attorney work. 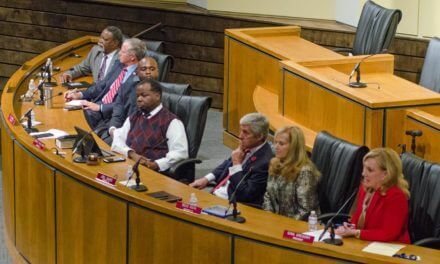 Following Wilters’ retirement announcement, the Baldwin County Judicial Commission requested applications from attorneys who wished to fill the position. 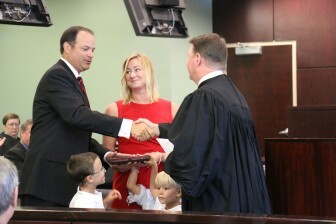 The commission sent Bentley the names of Taylor, Stankoski, and William “Bill” Scully Jr. as finalists for the Circuit Court Judge position, which Taylor ultimately won. 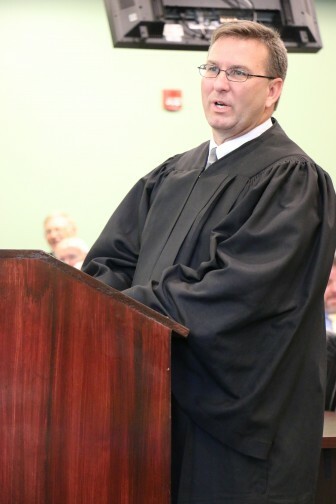 For the District Judge position, Stankoski was selected over finalists Scully and Thomas Pilcher.